The Gustav Line stretched for more than 150 km from the Tyrrhenian Sea. After the conquest of Sicily (operation Husky), the Germans had no illusions about how the Italian government would behave towards the Allies. Mussolini was overthrown on 25 July 1943 and the King of Italy called upon the elderly Marshal Badoglio to assume power. Marshal Badoglio, faced with a population that was sick of the war, was forced to capitulate before the Allied advance on 3 September 1943. 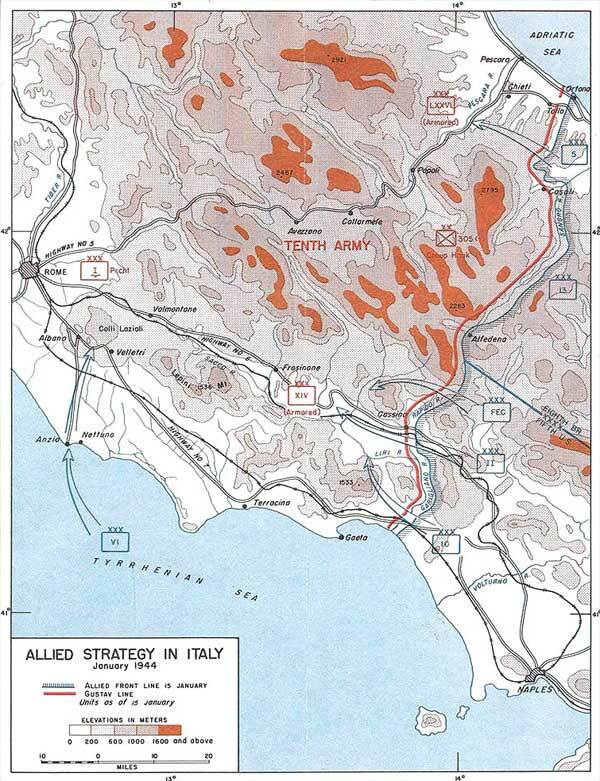 The Germans, aware that they would not be able to control the whole of the Italian peninsula, quickly revised their plans to take account of the loss of the south of Italy. They decided to build a fortified line from Pisa to Rimini. Subsequently, the Germans used the mountainous Italian terrain to their best advantage and built a series of fortified lines between Rome and Naples (approximately half way down the “boot”). First of all, the Viktor Line was put in place. It followed the River Volturno in the west and then went into the mountains to meet up with the Biferno River in the east. The Germans then drew back behind the Barbara Line, which consisted of a series of strongpoints that were intended to slow down the advance of the Fifth Army. 15 km to the north of the Barbara Line, the Germans constructed a second line, the Bernhard Line which ran from the mouth of the Garigliano to the Matese massif. Even further north the strongest positions were set up, forming the Gustav Line. This consisted of a series of fortifications constructed by the Todt Organisation using units of engineers, other German soldiers present in Italy, and 44,000 Italian workers. The Gustav Line stretched for more than 150 km from the Tyrrhenian Sea. It ran along the Garigliano, crossed the Apennines, in particular the Abruzzi, and came to an end where the River Sangro flows into the Adriatic Sea. 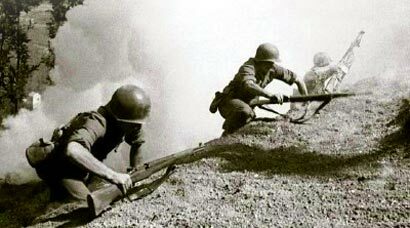 The line was fortified with canon emplacements, concrete fortresses, machine gun emplacements and flame-throwers, barbed wire and minefields. Positions were strengthened with dugouts for single soldiers and trenches. Villages and towns were transformed into fortresses. The Gustav Line was studded with Panther turrets and M6 panzernest (armoured bells for machine guns). Monte Cassino was roughly at the centre of the line (hence the expression the “bolt” of Cassino). The town of Cassino, therefore, needed to be fortified to a high degree (although the monastery of Monte Cassino was not occupied by the Germans nor fortified). The Gustav Line barred the way to the north of the country and to its capital, Rome. Kesselring was convinced that the Line would block the Allied advance; he thought, in his words, that they would “break their teeth” on it. He was not proved totally wrong, as the Allies took five months to break through the Line even though it was broken for the first time by the French on 26 January 1944 (11th Company, 3rd Battalion of the 4th R.T.T. ).